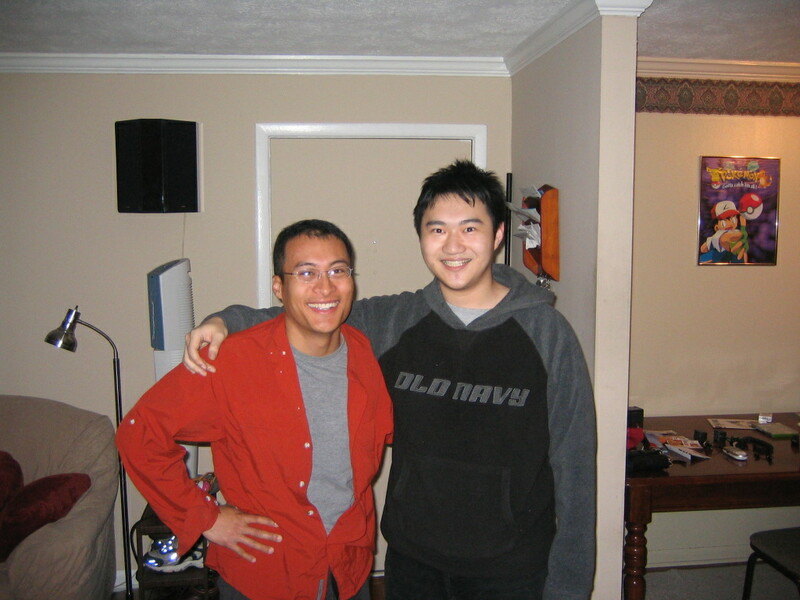 Edwin’s Blog, how’s that for a title! Quit my job and roadtripped across the US, traveled in Central America, cycled the Pacific Coast, got a new job (and worked for 10 months), now I’m back roadtripping up to Alaska! The FINAL Entry….Where to from Here? Alas, the new year is upon us. I successfully made it all the way to New Jersey, spent Christmas with my brother and his family, and then headed off to New York’s Penn Station to ride the Amtrak to Chicago, and then onto Portland via Amtrak’s Empire Builder. Unfortunately, I was not able to sell my car. People that were interested in it just flaked out at the last minute. I would have sold it for $300, even less, because now I have a headache trying to donate it. The great, fully functioning 1988 Honda Accord LXi with power sunroof, power windows, power locks, automatic transmission, A/C and CD stereo (even though my seller lost its faceplate), can’t even pass muster with charities like St. Vincent DePaul, the Red Cross, the Cerebral Palsey Foundation of New Jersey and others. There are 3 things going against it. First of all, the charities accept the donation because they will try to sell it at auction and get a portion of those proceeds. But how can you sell something at an auction, or anywhere for that matter, that has no value? 1. My car is 17 years old (soon to be 18 years old tomorrow). Most places I called have a cut off at 15 years. 2. The car has over 250K miles. 3. It has a salvage, reconstructed title. Which means it was in a prior accident. Thus, nobody wants it. Well, I know it can make for good, basic transportation for somebody. But now that I am on the other side of the country, there’s not much I can do now. I was gone for a total of 27 days, so I spent an average of $81.50 per day. For my next trip, my goal is to be under $25 per day…. * Visited historic sites and memorials such as the Alamo, MLK Jr. Memorial, JFK Memorial, Richmond’s Battlefield Park and Kitty Hawk. * Tried some regional fare: jambalya in New Orleans, famoun beignets at Cafe Du Monde, Cracker Barrel, Waffle House, The Varsity in Atlanta–but didn’t make it to a White Castle or a Krystal. * Went biking all over town: Tempe, Tucson, Dallas, Austin, Atlanta, & Virginia Beach. * Got to hang out with some really great, cool and fun peeps! Old friends and new, it was fabulous to catch up and to learn anew. * Relished the odorless carbon monoxide and the dingy smell of burning oil…these I will definitely not miss! *Practiced rolling my Rrr’s with my tongue, in preparation of my next adventure. However, 4 weeks and I am a complete failure! I just don’t think my tongue was made to roll the rrr’s!!! *Rode the Amtrak and met even more great people. Like Sarah and her boyfriend Tim from Minneapolis, MN. Mike, an advertising salesman from Missoula, Montana. 10-year old Wednesday and her mother Malaya, who spent one year abroad teaching English in China. I also watched 4 movies, read 3 books, read one Reader’s Digest, read one magazine, did some journaling and gazed out the window as the scenery skipped on by while listening to my walkman and just getting lost in the moment. 4 weeks is not enough. Not enough to satisfy my wanderlust. There’s still so much to do, so many places to go, new friends to meet. For although I did miss the comforts of home, I know Portland will always be home for me and it will always be here–in the past, in the present, in the future. Who knows when I’ll have another opportunity to see the world. No time like now. And thus it is almost time for me to go once more. I just put in my 2 weeks’ notice at work. My last day will be on January 13th, which coincidentally is my birthday. What not a great birthday gift to give oneself than that of another adventure? I have a roundtrip ticket for Portland to Guatemala in Central America. I leave in 3 weeks and will be back in June. I’ll be taking Spanish language immersion classes and then spending some time to travel to Belize, Honduras, Yucatan Mexico and around Guatemala. And when I come back, I’ll bike from Vancouver, BC along the Pacific Coast down to Tijuana, MX. And by August, I should have time to hike the Wunderland Trail around Mt. Raineer, WA with my AmeriCorps friends Dan and Tim. And by then all my money will be gone, I’ll be flat broke, and I’ll start all over again. A new adventure will always await. Thanks for sharing in all my thoughts and travels. Make it happen. There’s no time like now. 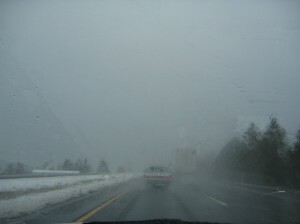 It was quite a harrowing drive from Richmond to New Jersey. First of all, it is the Friday right before Christmas Eve…so, scores and scores of folks making their way north, south, east, west and every other direction. This resulted in massive traffic jams all along Interstate 95, the I-5 of the East Coast. Numerous fender benders plagued the progress, if one can call it that. My car certainly didn’t like it. It took me one hour to go 5 miles. Thought my car was going to explode (when I bought it, the seller told me that the gauge tracking the overheating of the car was broken). The toll roads were something I was not used to. Paying $5 to cross a bridge? I paid close to $15 in tolls for my last 180 miles. I did make it into Baltimore and checked out the Inner Harbor. And also ended up in the really seedy side of town, which incidentally is adjacent to the Central Precinct police station. I figured I spend a few hours and let the traffic congestion alleviate a bit. So I headed back out on the road at 8pm. The 180 mile drive ended up taking 4.5 hours. It didn’t help that I took the really long route through Delaware and Philadelphia. Instead of going Northwest and North along the New Jersey Turnpike, I ended up going Northwest, then East, then South, then Northeast, and then finally North. And once I got to the township of Colonia, I couldn’t quite find the house. But I, and the car, made it! So there! All you who wagered that the never-say-die Honda would waver in those Southern states, HA! Well, I have to admit that I too wasn’t so sure that the car would survive. But it did. And now, a quandry. I can’t sell it. Seems all the folks that contacted me regarding my Craigslist posting have flaked out. Or changed their minds. I tried to sell it to some used car lots, but because of its age, 250K miles, AND it’s reconstructed salvage title, they won’t touch it. I went to a flea market and tried to sell it there too, in the parking lot. My brother tried to help and called all his buddies. Nope. And all the donation places that I wanted to donate it to, well, they are closed until Tuesday. So I’m in a bit of a dilemma. I don’t just want to leave it and be liable for anything that could happen. I’d like to get some money out of it, but fat chance of that happening now. I could take it to a junk scrap yard, but I don’t know. I’ll have to decide by tomorrow cause that’s when my train is leaving. I can’t believe no one would want to buy my car for even $400, after all it did make it over 5000 miles with nary a problem. So maybe this means something….maybe it means that I leave it here, and come back in the early summer to drive BACK to Portland, but this time taking the northern route via the Midwest, Minnesota, the Dakotas et al. And I’d get new back tires for it for that journey. But I haven’t decided yet. Maybe Santa will give me a sign of what to do. I also didn’t plan for all the stuff I’ll have to bring back. I ended up getting a big rolling duffle bag for all my bike gear, marathon stuff and souvenirs/gifts I’ve collected along the way. Just hope Amtrak will be able to accommodate all that stuff I have to bring back. My bike is staying here. Check out my previous entries, as I was able to add a few pics under ‘Outer Banks’ ‘New Orleans’ and ‘How to Save on Travel Costs.’ I should have most of my other pics available next week when I get back. Hope everyone is enjoying the holiday weekend. Check back later in a few days as I’ll have my final stats for this cross country trip and parting words until my next big adventure in January — hello Guatemala! Took a brisk early morning stroll today along Richmond’s “Canal Walk,” which concluded with a tour of the Richmond Civil War Battlefield Park Visitor Center. Watching the short film and viewing the exhibits about the dates, events and locations of the Civil War was fascinating and surprised me. It has been such a long time since my high school history lessons that I had forgotten just how important this war was in shaping the America we know today. For example, I did not realize that the 4-year war claimed almost 1 million casualties, both military and civilian. Recounting key figures included Stonewall Jackson, Robert E Lee, and Jefferson Davis on the Confederate (Grey) side. On the Federalists, or Blue Union side were Ulysses S. Grant and Abraham Lincoln. Reading about military strategy and the mistakes that were made which resulted in thousands of losses in key battle sites was really quite mind boggling. In the end, it was the brute force and strength of the Union army that eventually took over the capital of the Confederate states, which was here in Richmond. I always ponder about historical events and what life would be like now if the results were different. At any rate, these visits to historical sites makes me long to spend more time here to delve more in-depth into our nation’s history, but alas, it will have to wait for another time. 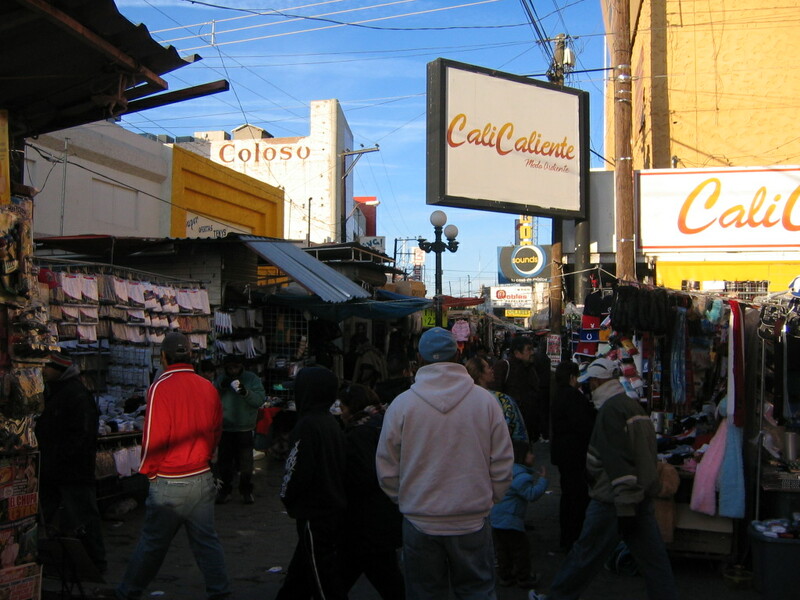 I’m heading off to Baltimore today and then on to my final destination at my brother’s home in Colonia, NJ. I’m not out of the woods yet, it’s still a good 400 mile drive to go and I’m wondering how much money I’ll spend forking over to the infamous toll roads of New Jersey. Have a great holiday weekend all, and in my next entry I’m hopeful that I’ll be able to say that I not only made it all the way to New Jersey in my great 1988 Honda Accord, but that I was also actually able to sell it!! Thanks for reading my blog. I would normally keep a journal, so this is all new for me. It has been hard to find public internet terminals, or even Internet cafes. One place in New Orleans was charging $8 an hour to use the computer’s internet! I really lucked out as far as the weather. It sure has been cold, but thank goodness none of the wet stuff. A day ago the low hit 19 degrees. When I got gas today, when I picked up the squeegee to wipe down my windshield, the cleaning solution it was in was frozen. I appreciate the non-essential work updates from Hope and Nicole, as well as contributions from Rashad, Kelly and Katie. Where do y’all find those interesting passages from books and magazines? Glad to hear that laughter and silly playtime during your lunch breaks. You’ll have to fill me in on “Divinity” and all the daily “peace and joy” holiday treats that appear in the break rooms. I really enjoyed my few days in the Ca-ca-lackeys. Locals refer to the Carolinas as such. Greenville, SC is definitely worth a visit. They have a great little main street area that leads to a city park and waterfall with a pedestrian bridge. I ended up eating and doing a little Christmas shopping there. Wilmington, NC is also a nice waterfront surprise, near Cape Fear. Charlotte was nice, although there is absolutely no downtown street parking whatsoever. If you happen to find a parking meter, make sure you don’t get there at 4pm like I did. Because on each meter there is a sign of a tow truck and a warning NOT to park there from 4pm-6pm. Cause they need all their lanes for rush hour traffic. Williamsburg, VA is like a historic Disney theme park. They have a section of the city devoted to the historic village, complete with folks in costume, carriages, British flags and other old-world touches. But you have to buy a pass for almost $30 to visit some of the buildings. Otherwise you can wander the grounds and take in the old buildings and houses from the street. Richmond is pretty cool, which surprised me. I didn’t expect there to be so much to see. The Edgar Allen Poe museum is here. Carytown is like a longer version of Portland’s NW 23rd Avenue. They have a huge city park with hiking, biking, and even rafting opportunities. Tomorrow I’ll do their 1.5 mile Canal Walk and check out a Civil War historic site. There is a lot of history with all the cities I have visited. I wish I really had more time to spend and to discover other smaller towns and communities. I am a bit road weary, as I’ve had a lot of nights where I’ve stayed up pretty late just chatting with my hosts and hostesses, and then waking up around 6 or 7 to get an early start on the next city to drive to. When I am old and “retired,” I’m pretty sure I’ll be one of those senior citizen people traveling around in a Winnebago and being volunteer hosts in campgrounds. Well, maybe not a Winnebago. Something more like the Honda Element like I used to own. Something with AWD, a great sound system and plenty of room for my bikes, camping equipment and outdoor gear. I still have like 100 national parks/monuments and sites to visit. And I still have to make my drive from Portland, OR to Alaska. So, who wants to come do the Alaska drive? Those that need the pampering of a nightly hotel room need not apply! Time to wrap it up and get some sleep. So what’s with the Outer Banks? What are the Outer Banks? It’s the name that really drew me. About 2-3 years ago, the Travel Channel had one of their specials about the best beaches. One of the beaches being the most unspoiled. And it was somewhere along the Outer Banks. Naturally, I had a certain image of what the Outer Banks looked like. Untouched. Unspoiled. Under or not developed. The Outer Banks refers to a chain of islands off of North Carolina’s coastline. Highway 12 runs along most of it in a 100-mile arc, with a couple of ferries linking it to the mainland. The islands are very narrow, maybe less than 3 miles wide. I woke up at 4:30 am Wednesday morning to make the 1-hour drive to the Cedar Island Ferry. It is a 2 1/2 hour crossing, and I ended up falling asleep in my car before awakening a few minutes before arriving at Okracoke Island. Okracoke island is fairly small, only 14 miles in length. You have to drive the 14 miles to the end of the island in order to catch the other car ferry and 40-minute crossing to Hatteras Island. * Graveyard of the Atlantic. For over 400 years, the waters off the Outer Banks have been among the most treacherous in the world, where so many ships and lives having been lost that the waters along the Outer Banks are known as the Graveyard of the Atlantic. As a result, there are numerous lighthouses including the Cape Hatteras Lighthouse, which at 208 feet is the tallest masonry lighthouse in the U.S.
* Finally, the best for last. Blackbeard. The pirate was a notorious visitor of these parts in the early part of the 18th century. He got his well-known nickname from his thick beard that he braided and put smoking matches into during battle. His heyday was in 1717 and 1718, but just inside of Ocracoke Inlet on November 22, 1718, 2 British ships caught up to him and a battle ensued. This was to be Blackbeard’s last battle. British soldiers shot him, stabbed him, slashed his throat and cut his head off. His head was taken back to Virginia, where it was on display for many years. His body, which sustained more than 25 mortal wounds during the fight, was thrown overboard into the pirate’s favorite anchorage – Teach’s Hole – a place that has carried his name for more than 275 years (Blackbeard’s real name is Edward Teach). What I find most interesting is that “Despite Blackbeard’s fearful intentions, records show he was seldom brutal. By striking a fearful reputation ahead of time, he often found little resistance.” A little psychological warfare tactic! After all the images on TV, the numerous articles in the papers and magazines, and the interviews with survivors of Hurricane Katrina, I wasn’t so sure about making a visit to New Orleans. I arose and left Houston, TX by 8am last Thursday. It was a sleepy drive and only a hearty breakfast of biscuits, sausage, bacon, toast, eggs and grits at the Cracker Barrel perked me up (maybe it was just the grease). The day was warm, sunny, just a few clouds in the blue sky. * Canal Street is very wide, with at least 2 lanes in each direction, and in the middle of the street runs the famous St. Charles Street car. This middle section is grassy with some trees and stops along the route. The streetcar would not be running today, and I doubt anytime close to the near future. * Canal Street is a very major street, a central arterial to the French Quarter. Yet on this Thursday afternoon, it was absent of any other traffic. Just me and a few other cars. Working cars, that is. Cause on the street curbs and down the neighborhood side streets, there are a few cars all right. But something is not right. It’s that they are inoperable and abandoned. Many have dried mud caked to their frames. * I slowly crept along Canal Street and looked down the side streets. Side streets that once displayed rows of habitable houses, now cast an eerie silence of emptiness and abandondment. 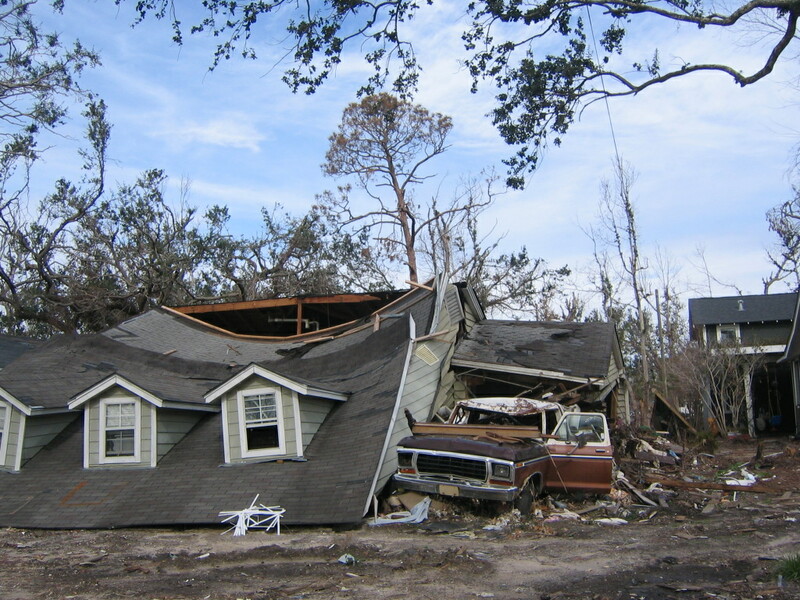 All around the sidewalks, curbsides and streets lie debris–wood, garbage, fallen tree branches, furnishings, etc. etc. * It is strange to see businesses shuttered in plywood — everything from gas stations, McDonald’s, restaurants, convenience stores, Rite Aid, Wallgreens and other businesses small and large. * The houses themselves are mostly in shambles. Yellow spraypaint marks some homes – I don’t know what the symbols come to designate, I can only imagine. Some people have put “For Sale” signs on their homes. * Canal Street, right up until the French Quarter, has no operating traffic signals. Just temporary stop signs attached to those folding construction markers. 4 ways stops at major intersections. Those businesses that are open, have homemade signs created of cardboard and black marker pens announcing “We are open.” But I would reckon that it would be difficult to remain open and in business when you have no customers. Therein lies the problem. * My hosts for my stay stated that New Orleans has 500,000 residents, and the metro region over 1,200,000. Now, 3 months after the hurricane, that figure is around 60,000. I can’t argue there, not with what I’ve seen or more accurately, what I haven’t seen. * The businesses that are open seem desperate for workers. “Hiring Now” signs are just about on every business that is open. Most of the help needed is for service workers, from small retail stores to fast food outlets, bars and restaurants. * Major hotels in the French Quarter are closed up. These include the Days Inn and the mega-big Harrah’s Hotel and Casino and other chains. Fancy stores like Saks Fifth Avenue are out, as are many in the Riverwalk Mall. Just emptiness. One upscale mall, the Canal Place Shopping Center, had some sort of “Reopening Announcement” that lured in office workers and other people with free egg nog, cookies, apple cider, music and more. Apparently the stores were not open yet, it was just some way to drum up anticipation for when the stores finally do reopen. * The French Quarter is pretty darn BIG. I thought it was a small section of New Orleans, maybe like Portland’s Old Town district or maybe like the Pearl. Actually, the French Quarter consists of 80 blocks is an official National Historic District. There’s a lot of really cool architecture with buildings featuring balconies and rows of shops, restaurants, bars and more. * The French Quarter did sustain damage, but not as extensive as some of the neighborhoods and homes that you may have seen on TV. Bourbon Street nightlife attracted a good number of tourists, and there are still plenty of clubs advertising the 3 for 1 and 2 for 1 drinks with their banners and signs. Music booms out from the clubs, and partygoers with beads still attempt some wild fun. Mounted police on horses march up the street, with barricades set up to divert traffic from the pedestrian-only area. * My hosts, Sean and Alison, introduced me to their friend Jack. Because Sean and Alison just lost power to their home the previous night, they would not be able to accomodate me as per my Couchsurfing request. But Jack had hosted others before, and I was able to crash at his place, which was very convenient because it was pretty much in the French Quarter. We ended up going to a cool club “One Eye Jack” for drinks and some 80′s retro dancing. * Leaving New Orleans, I tried to take a scenic tour along the coastline to Gulfport and Biloxi, Mississippi. However, a major bridge linking the two states was out and I was detoured back to the Interstate. I was able to drive the stretch for a good 10 miles, and what I saw was even more devastation and ghostly neighborhoods of empty and shuttered buildings. In one section, the road paralled the busy interstate above. Directly underneath the overpass highway were car graveyards. For at least 8 cityblocks there were rows and rows of vehicles that were towed to this final resting place. Cars and trucks with mud, shattered glass, stolen rims and no owners. All just sitting there like in a junk yard. Gulfport because the rest of the highway was closed. 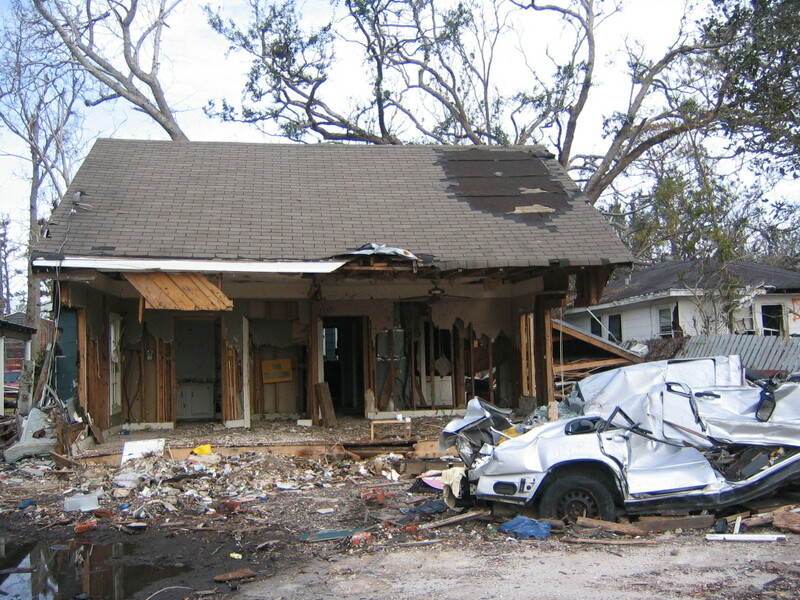 I spent a lot of time in one Gulfport neighborhood just in shock at all the destruction. 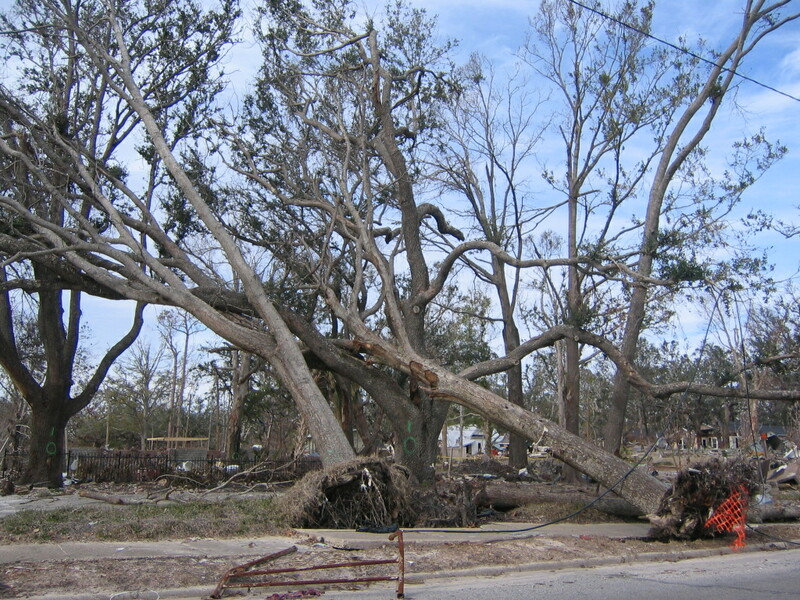 Trees were uprooted and houses were smashed like some giant had stepped on them. Whole neighborhoods were literally just turned into nothing but debris. A sign for Outback Steakhouse and a Waffle House were all that remained in what was once a very busy section of tourist-road dining. Despite all the destruction and emptiness I’ve described, there are signs of recovery. There are construction trucks, bobcats, bulldozers, dumptrucks and more in many neighborhoods. Workers in orange jackets are cleaning up, restoring, rebuilding. Tourists are coming back, hotels and other businesses are opening up. One homeowner in Gulfport was pounding nails into a windowframe intent on living in his home again. It’s going to take a long time though. My short visit to New Orleans and Gulfport was a real eye opener, especially given the fact that these once thriving communities are now just former shells of lives that have moved on and may likely not ever return to a place people once called ‘home.’ How can you run a business if you have no customers? 15 minutes of internet time…. The car is still ticking, somehow, someway, and I don’t want to sing all its praises just yet so I don’t jinx it. Unfortunately, if I do make it to NJ, I still don’t have any takers. So I’ve lowered my Craigslist price from $600 to $450. But with the holiday spending and shopping, it might be hard for someone to come up with the cash to pay for it. So I guess I’m prepared to donate it. I still a bit surprised that it has already gone over 5000 miles. * The J-shaped 2 foot long crack in my windshield is still there. As is a new rock chip. * The 99 cent handmirror I bought and superglued to my sideview mirror is still there. * The busted out tail light that lets all the rain seep into my trunk….still there, albeit with a little duct tape. Most of the water in my trunk has dried out, but we are expected to get some rain on Saturday. * Timing belt–still holding it together. The car does start out a little rough in the cold mornings…jerks back and forth for a little bit before getting its stride. I spent the last two days in the Outer Banks. Home to the first flight, the first “Lost Colony” (forget Jamestown), the ‘Graveyard of the Atlantic’ and also final battle of Blackbeard the pirate, as opposed to the celebrity chef… Blackbeard the celebrity chef was the 2003 recipient of the Iron Chef World championships, as he and Wo Wong Pack Hsuy battled out with the secret ingredient, pickles. Boy, I sure wish I could have tried some of those pickled pickle pastries! Virginia Beach has a cool 2.5 mile boardwalk that I cycled this morning…however, many of the hotels, restaurants and shops have been closed up for the winter season so it’s pretty empty. Except for the guy who helped me take my picture and tried to sell me a flute. And also told me about his degree in ministry and how he hopes that the new woman in his circle really wants to be a witch and not just temporarily. And of course he’s also a Vietnam vet and could I help him out to buy a burger. Unfotunately, I already gave most of my change to a fellow in Atlanta who, after I provided him change in his hand, then asked if I had a dollar bill instead. How To Save on Travel Costs! In anticipation of my cross-country road trip, a couple months ago my friend Adam allowed me to borrow his book on car camping. Car camping? Yes, someone actually wrote a book on car camping. Basically about living in your car, how to do it, why people do it, etc. The author presented her book as the main text at a college class she was teaching, all about car camping. Actually, about it’s about car living: “Car Living: How to Make It a Successful, Sane, Safe Experience (Paperback), by Jane Archer. You can find it at Amazon.com if you are so inclined. On previous road trips, I had slept in my car. A great 1992 Toyota Corolla which I still drive with over 200,00 miles on it. 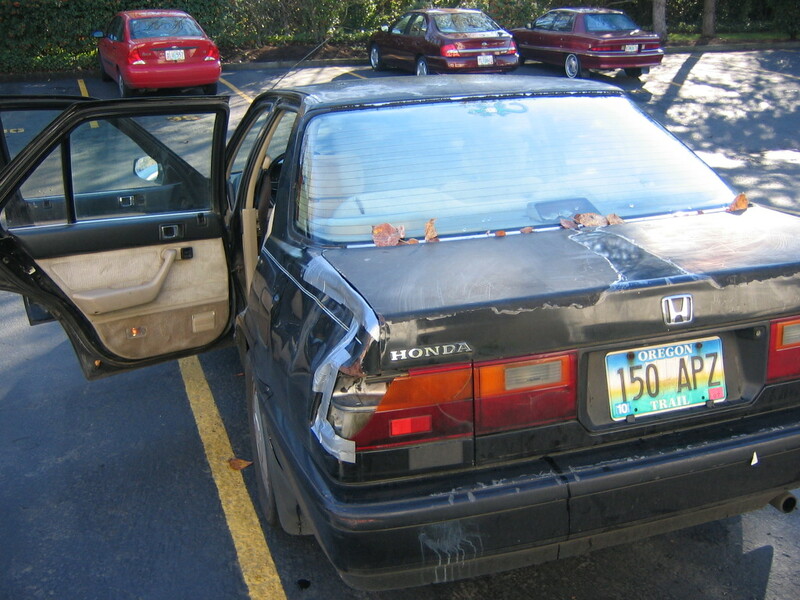 But with my 1988 Honda Accord wreck, I was a little more leery about the prospects of sleeping in my car, especially since my friends joked that it leaks of carbon monoxide and oil. Plus, with my bike taking up my trunk and back seat, I wouldn’t really be able to fully recline back. Doable, but not really comfortable. In travel, there are 4 major expenses one must consider when budgeting out a trip. First, there is transportation. Plane, train, auto, boat, donkey, Jeepney, turtle, Segway, dolphin, magic carpet, what have you. Second, human fuel, i.e. food and drink. Third, lodging. And then you have everything else in the 4th category–entertainment, souvenirs, admission fees, communication, etc. etc. I have no worries about transportation or food or the other expenses. Since I would be going to so many cities, my biggest expense would be lodging. I had no problems the first three stopovers, since I’d be staying with my friends. But once I got into Phoenix, I’d have to make a choice: sleep in my car, or spring for a hotel room. Decent hotel rooms can be had for $80 or so. Of course, if you drive a little further out or don’t mind a no-frills basic room in a seedy part of town, you can probably go as low as $39.95 plus tax. Well, let’s see… an average of $45 per night times 15 nights = just under $700. Furthermore, I make about $7.25 at my job, so $700 is like a whole month’s paycheck; hotel room, I don’t think so. Sleep in my car then, right? Not quite. Thanks to the power of Internet, a new travel network has sprung up for those independent travelers who seek a different alternative. Welcome to Globalfreeloaders.com and Couchsurfing.com. These two web sites are based upon the concept of offering your home to fellow travelers and creating connections for opening up a new world of travel. Aside from one night in Montgomery and two nights in the Outer Banks, all of my sleeping arrangements have been successfully set up through these two web sites. My experiences have been incredible and I am so glad that I am part of this network. So, you may be wondering, what kind of people trust others to open up their homes? Phoenix: Nicole and her boyfriend are late 20-somethings who are shortly embarking on a one-year, round-the-world journey. They’ve run marathons, rode elephants in Thailand and are just about the nicest people you can hope to meet when coming into a new city. 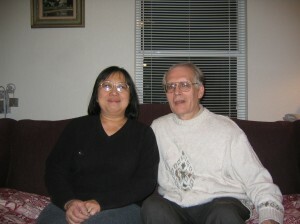 El Paso: Juris and Molly are semi-retired and have lived in El Paso for the last 3 years and are raising 2 teenagers. Dallas: Phil and Meghan. They rock. They’ve given up the corporate job lifestyle to work in the nonprofit sector as legal aid advocates and are very passionate about their beliefs and ideals. San Antonio: Lorna and her two teenage daughters Allison and Ashley. What a vibrant household! Lorna used to live in Europe and speaks Italian and some French. They previously lived in Renton, WA before moving to San Antonio 5 years ago. Houston: Emma! Emma spent most of her childhood growing up in Portland and now goes to school in Massachusettes. But what is most incredible is that she is currently assisting author Douglas Brinkley on his new book about Hurricane Katrina. It should be published in April. 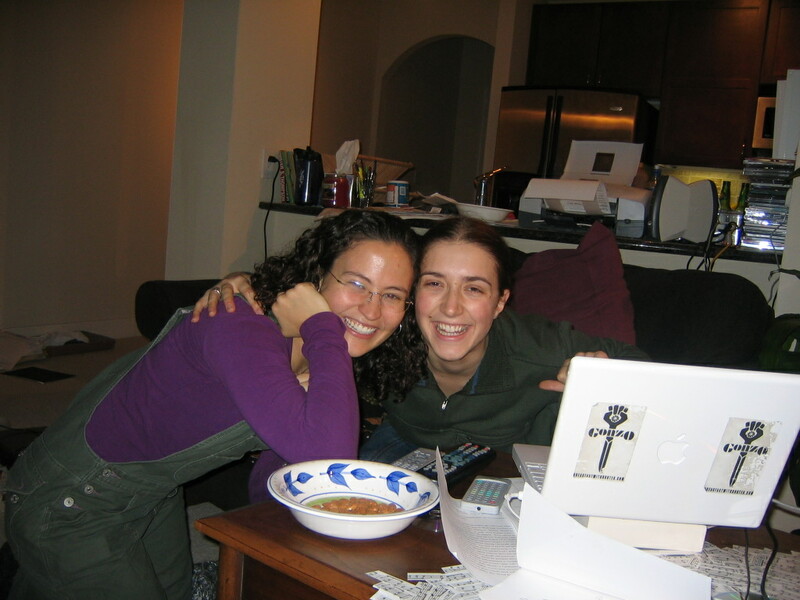 Below: Emma (on the right) and her friend Janell, who is also a Couchsurfing member. We stayed up watching The Birdcage. 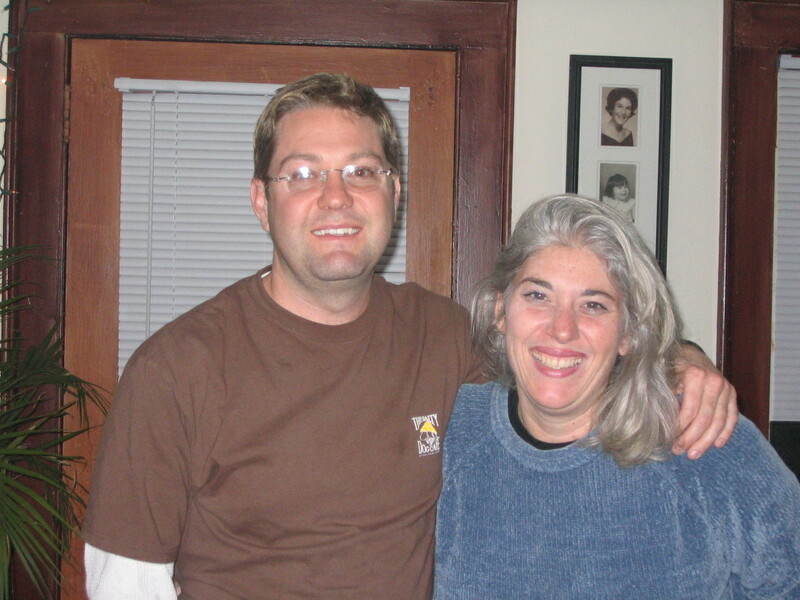 New Orleans: Alison and Sean were displaced by Hurricane Katrina and ended up living in the Portland, OR area for the past few months because of their family connections and just recently returned to the city where they both went to college. Because we were having a late night at the club “One Eye Jack” in the French Quarter, I actually ended up staying with their friend Jack, who lives very close to all the action. Below: Sean, Alison and Jack. Atlanta: Yale, who should have his own sitcom! He has a great pad in the Buckhead section of Atlanta, which is close to all the best restaurants, bars, independent movie theaters and nightlife. He lives with a bunch of fellow bachelors playing music, watching movies, playing video games, hanging out, going out and just generally having lots of fun. And I have to give him the props for allowing me to use his laptop to update my blog. I felt like I was in a glorified episode of Seinfeld, there were so many people coming and going and it was so thoroughly entertaining. Atlanta: I also stayed with Danielle, currently working for the government and trying to decide on her next move in life–I say to go ahead and go to school in New York! She also lived in a really cool area of the city and I was able to go out and meet her friends over drinks at a sweet little Pan-Mex restaurant and bar. Below are Ben (who once drove all the way down to Panama with his buddy) and Danielle. Charlotte: Terri and Brian. Too cool, way cool, I had the best time just hanging out til the wee hours of the morning talking bout’ whateva. Southern Hospitality fo sure! I stayed in little homes and big homes out in the suburbs, in high rise luxury condo buildings with valet parking and a 24 hour concierge, so apartment lofts and homes with my own room and bathroom. I’ve slept on air mattresses, floors, separate queen beds, single beds and couches of all shapes and sizes. I’d have to say that the best part about couchsurfing and staying in stranger’s houses is not just about the money you save. It’s about the people you meet. It blows me away when I meet my hosts and hostesses. So many stories, so many thoughts and ideas about the world. I get the inside scoop on things to do, places to see and restaurants to eat at. I also get to find out about local issues and learn about the things that are important to them. Though we may come from different backgrounds and cultures and upbringings, in all the people I’ve come to know and befriend through Couchsurfing and Globalfreeloaders, we all share the same kindred spirit of this travel exchange. Couchsurfing is not for everyone, and it takes a different kind of wiring to consider this form of sleeping arrangement. And I’ll be the first to admit that it is nice to get your own hotel room and just vege out for a night or two and spend some alone time to read or write or waste your time in front of the television. 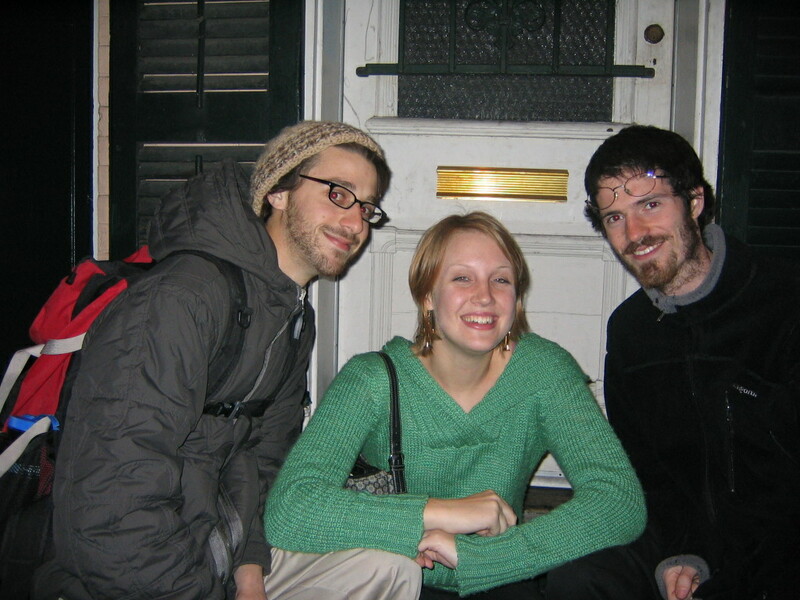 But for getting out and truly meeting people and staying with them, couchsurfing is a tremendous way of travel. One guy, Steve Savage, has been doing it for over 2 years and is now currently in Europe traveling in this fashion. I probably couldn’t go for that long, but never say never, I have not yet had one bad experience couchsurfing and look forward to my text trip domestic or abroad when I can do this again. Check it out! And you can find my couchsurfing profile by searching under ‘Portland, OR.’ Til my next opportune internet time, enjoy! * Mike J – keep up your fine work and get back that VIP status so we can return to Vegas again. The way you’ve been picking, you should be the feature VIP and consider this your new professional career! YOU is on FIRE meng! * Jonas – are you sure it was sugar? Didn’t have any so I tried pouring down some grits in my tank. That didn’t seem to do so well, so I promise you, next time I’ll go for the sugar. * Hope – no didn’t make the spontaneous trip to Birmingham, but I can understand how King Jr. could move you and your friend to do that. New Orleans was almost like another world–just so empty with rows and streets of houses and buildings abandoned and in shambles. * Aliscia – sorry bout’ the mystery of the keys! We should definitely get CSI to investigate, cause that is so strange that they ended up missing like that. * Lisa – in Greenville, SC a restaurant menu featured ‘Sammiches’ – so I promptly informed the management that they can’t spell and they need to write their menus in English so people know what they are ordering. Sheesh, sammiches? * Dave – still haven’t tried your recommendation. You should let us all know about your experiences and extol the health benefits of such a diet. * Mike R – sorry brother, you can’t touch me in the standings. That goes true for the once and has-been HoopKings and this week’s opponent Jeremy’s no-name team. Looking forward to getting back my championship belt when I return–I’m calling you out Adam! * Jenna – it’s super to hear from ya! You have had quite the experiences with trying out all those jobs and I’m happy to hear that you are enjoying your current line of work! * Sandra – yeah, I totally missed out on this year’s party, I went last year and had the best time! My Phoenix hostess told me about another Boots n All sister site, www.whygo.com. It’s a daily dose of travel inspiration that highlights reasons why we travel. At any rate, you’ll have to tell me all about the party and your most recent adventures in Mexico with your husband! And I’ve had the Amazing Race being recorded so I’ll get to see who won it all when I come back. You should totally apply for next season! * Chris – you were the last victim to eat my dunk, cat got your tongue? Or actions speak louder than words and you’re just waiting for when I get back? You better be ready and be afraid. Be very afraid. * Kathy R – thanks for checking in on me, you are like my second mom! Keep Edmikabe Expressway fun and real and watch out for Mr. Fun Police, Mr. Ade cause he is soo by the rules and he’ll report you for wearing non-corporate day attire! * Nicole – have a peace and joy holiday and thank you for saving those scrambled eggs for me from the holiday party — you can just go ahead and put them in my desk for safe keeping. * Monica – you should stay home when you are sick. Not nice going to work and getting other people sick because you decided not to wear any gloves outside. Oh wait, you are a Coug and that’s just how you are, my bad. Don’t be a hater. * John – thanks for the shout out and I’m glad you were able to avoid all the snow and ice. I didn’t see Booker T in Houston or Brent Berry so I’ll have to try again next time. I’ll be down for Royal Rumble come January! * Marcus – so what’s up with Kwanzannakuh for this year? You better come play basketball with us when I get back, who cares about overrated knee surgery and blah blah blah. * All the peeps I’ve met on my road trip – it’s been an incredible experience and you are all super awesome and welcome anytime you come visit Portland! * Most expensive gas: $2.49 per gallon, California. * I really can’t thank the inventor of the automobile cruise control enough. 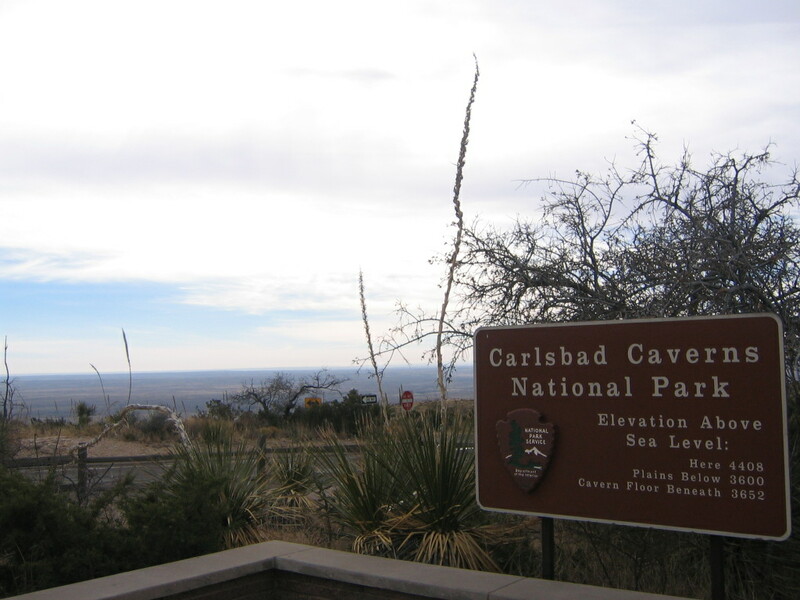 On my drive from El Paso to Carlsbad Caverns, I lost the ability of cruise control. Stepping on the gas for 3 hours straight made me really appreciate the virtues of automatic cruising. * Although I still have doubts about my car’s ability to make it another week, my main concern now is the weather. Just a few days ago Atlanta had ice and sleet in some sections of the city, and similar storm systems are enjoying a stay in Virginia, Pennsylvania and New Jersey. It is pretty cold outside with that windchill! – playing basketball and ruling the courts with my lightning quick hops, money Jumper, and of course posterizing my unfortunate opponent with a triple reverse sommersault left handed dunk (sorry you were the last victim, Chris). – Lost. And the Amazing Race. Car has made it to Georgia! Didn’t spend the night in my car after all, ended up spending the night in a hotel in Montgomery. I’m now in Atlanta using the public express internet terminal at the library, and a growing mob of people want access to my computer, the pressure is on! * 7 lanes of traffic in Atlanta plus construction and every other street is called “Peachtree Street,” with other designations that follow it like “NE, Road, SE, Avenue, Drive, NW,” and blah blah blah. Streets normally change their names so it is pretty difficult navigating through the city. * The south sure does love its chicken…everything from KFC, Popeye’s, Church’s, Chic-Fil-A and Hartt’s Chicken buffet. I’ll have to try one of them out soon. * Mike gave me a suggestion for Krystal’s, similar to White Castle…okay brother, I’ve seen the Krystal and I’ll go for it next time I’m hungry! * Congrats to Eric who made the All-Star team for our basketball league. We didn’t make the playoffs, but considering this was our first year playing as a team, props to my teammates for having a great camraderie and playing as friends…can’t wait to get back to play some hoops! * Don’t know when I’ll have a chance to upload my pics, I tried unsuccessfully to use the library in West Point, GA–but their tiny library was closed. * My time is up on my computer, that’s all for now! I’m in Mobile, Alabama, pronounced Mo-beel. I don’t have a place to stay for tonight, so it’s either sleeping in my car or spending some money for a hotel, hopefully one with some internet access. I don’t have a laptop, so my best bet is to inquire about those with a business center…so if I don’t update this blog tonight, then you’ll know I spent the night in my lovely car! Quick useless stats before my public library internet connection is lost…. * My car has put on 4000 miles since Portland and has another 2000 to go. * The burning oil smell is really more pronounced and at times I can smell it in my car cabin. * I’ve been keeping an eye out on my tires….in Dallas, I put air in all four, as they were all underinflated. * The roads through Louisiana and Alabama are poorly maintained and my car jerks around on uneven road, sometimes it feels like I might lose control even though I’m at a steady 70 mph. The roads are that bad. * I promised myself that if I ate fast food, I wouldn’t go to the same place twice. So, here is your fast food count: McDonald’s, Carl’s Jr., Whataburger, In-N-Out, Hot Dog on a Stick, Del Taco, Taco Cabana and Jack in the Box—twice. In a moment of weakness, I did go to Jack in the Box a second time because I was craving an Oreo milkshake. So, I confess, I have no self-control and the milkshake got the better of me. But man it was soooo gooood!! * There are also a lot of Luby’s restaurants off the Interstate in Texas. Didn’t eat there. But I learned that it’s a cafeteria style place where a bunch of old people eat–must be those senior discounts. * I’m interested in finding a Whitecastle. Gotta try those famous sliders. * New Orleans deserves its own entry…definitely eye-opening. Much of the city is in ruins, deserted, abandoned and ghostly…however, there are signs of recovery, albeit slow and gradual. Hopefully I’ll have more time later. Spent most of the day at NASA’s Johnson Space Center, just south of Houston. Admission was kinda steep, but because of the bad weather there weren’t a lot of people there. Manned space exploration has always fascinated me from the time I was a little kid watching “Star Trek” and “Battlestar Galactica.” I can still remember when I was a sixth grader at Hosford Middle School when one of my teachers, Mrs. Newby, started crying because of the Space Shuttle Challenger disaster. Here are some cool things that I learned that I now share with you!! * The average cost for an astronaut’s space suit is 12 million dollars. * Launches occur at Cape Canaveral in Florida, but after lift off Mission Control is at Johnson Space Center. * Mars exploration isn’t rocket science; the real problem is the limitations of the human body and the effects of zero gravity on bone mass, muscle, etc. * The International Space Station is a collaboration of 16 nations that should be completed by 2010. The space station orbits the earth 16 times a day, and can be seen by the naked eye. * It’s now 12:3oam, and I can’t think or remember anything else, so that’s it for now…. Houston, TX. Founded in 1823 by Jeremiah “Gene” Hackman, it was once the site of a meteor crash site that could have, may have, perhaps so, wiped out the dinosaurs and ancient cavemen. Authorities are unable to substantiate this claim because they weren’t around then, but if they were, then surely the local Houston Chronicle would have their front page devoted to this catastrophic event (continuted on page C9). Leftover bones and tattered clothing were discovereed at Hermann Park (named after John “Gene” Park), and thus Houston was born out of the rubble and exploded to become the 4th largest city in the U.S. With no urban planning and being named America’s Most Unfit City, it is a city on the up and up and has a lightrail system to rival any transportation system consisting of wheels and donuts. The biggest draw to Houston, however, is not the Eiffel Tower or Disneyland, it is the local Houston Zoo. Whales were the first animals to be featured at the zoo, and then in 1801 dolphins made their debut to a delightful appreciative crowd of school children, dignitarians from Africa and the local militia. These reptiles performed wonderous feats of magic, such as tightrope walking, somersaults and painting with acrylic oils that were later sold to art galleries near and afar (go to any Thomas Kincade Gallery and give the code name “The Animal” to see these rare and priceless pieces of art). Later the curator added lobsters, pigs, bats, elephants and chimpanzees. It was the chimpanzee program that became the pride and joy of the organization, churning out performers for “BJ and the Bear,” “Cannonball Run,” and “The Wonder Years.” In 1765 an earthquake shattered the cages which held the wild mammals captive, and they integrated into society under the radar of the public. However, by using special sunglasses, townfolk were able to differentiate those who were human and those who were not. Finally, in 1799, Commissioner Gordon and multi multi multi billionaire Bruce Wayne formed a new branch of government “The People’s Coalition.” A year long curfew was imposed on all citizens, and before long, these ruthless zoo animals were rounded up and bequethed to the Queen of England on the famous Titanic oceanliner. Things returned back to normal, but the volcano’s damage had inflicted permanent damage to the Atzec ceramic plate collection and the aquaduct infrastructure. Taxes were increased and that’s how Houston was named “Space City USA.” Other famous Houstonians include Mr. Bean, Mr. Rogers, Mr. Clean, Mr. Ed and Mrs. Butterworth. Today, we had lots of rain, thunder, lightning, strong winds and a dose of “The Birdcage.” And there folks, is your short history lesson on the shaman tribe “Houston” and how the city became to be the number one exporter for pineapple and Enron stock. Heading down to Houston today, but thought I’d share a few quick thoughts on San Antonio. * The freeway system is quite perplexing; I’m a pretty diligent driver with knowing exactly where I’m going, but the way they have their freeways designed created quite a bit of backtracking. You have to pay attention to the signs on where you want to go, because there is little forewarning on the exit ramp. Traffic can exit on the left, merge on the left, there are turnarounds everywhere and road construction made it extra challenging on where I needed to go. * San Antonio is known, of course, for the famous Alamo. And no, there is no basement. But surrounding the famous historic site are: one Ripley’s Believe or Not Museum, on Ripley’s Haunted House Ride, a Madame Toussard’s Wax Museum, a Hagan Daaz ice cream shop, a Davey Crockett minature golf course, and so many tacky souvenir shops with T-shirts 3 for $10 and other great tourist ‘bargains.’ Pretty amazing to see how much commercialism springs up whenever you have lots and lots of people with money to spend. * My host family for this leg of my trip was Lorna and her two teenage daughters, Ashley and Allison. Lorna was very kind to let me hog up her computer to do my necessary email and travelblog updates. It is a vibrant and welcoming household which also features their cat and dog. Thanks again for your hospitality Lorna! * Other random thoughts: I’m hungry. * Other random thoughts part two: Yeah, I’m hungry. Gonna stop here and get some grub for my drive down to Houston. Hasta Luego. As per your request, since pictures tell a thousand words and my previous posts didn’t make much sense, here are some photos…. Fitting enough, Hollywood is coming out with a movie starring Jennifer Lopez about these unsolved murders. My host family, Molly and Juris, in El Paso. Molly comes by way of Malasia, and Juris via Latvia. Both very generous ambassadors to the city! 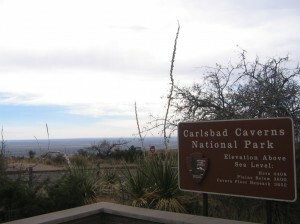 Carlsbad Caverns National Park. I signed up for a guided tour, but ran out of time as it took me 2.5 hours to do the self-guided walk in the underground trail. Thanks Melody for letting me borrow your National Parks Pass! You do not need to be a member of Yahoo to access the pics. One of the albums is of Costa Rica from last year, so ignore that one! Time to go play in San Antonio now! I’m in San Antonio and my host family, well one of the members anyways, is watching Lord of the Rings. So of course I have to peek away and watch the really good parts. Like when Sean Astin exclaims “But Luke, I AM your father! !” And then the ogre, who is holding Luke captive, clubs him on the head. At any rate, you know how it is always difficult in trying to figure out what to get your family members for the holidays? Cause they already have everything or what your really want to get them is just soo far out of your price range? Well, wouldn’t it be totally easy if you were a Hobbit? Shopping would be cake–like how about one of those foot bath massage things for their big feet? Or maybe the Flowbee? Hobbits seriously need to get some style with their hair. Maybe some blue highlights or a crew cut. It would be easy to buy for a Hobbit. Austin is one really cool town. They have a couple of greenbelt pathways that everyone plus their mother uses. Really, it was really quite inspiring, really. Did you realize that you just said really three times in the last sentence? Did you know that really consists of 2 syllables, 6 letters, and 2 vowels? Or 3 if you count the ‘Y.’ Really. And did you know that the human head weighs 7 pounds? And my neighbor has a bunny rabbit? Okay, back on track…. The greenbelt. 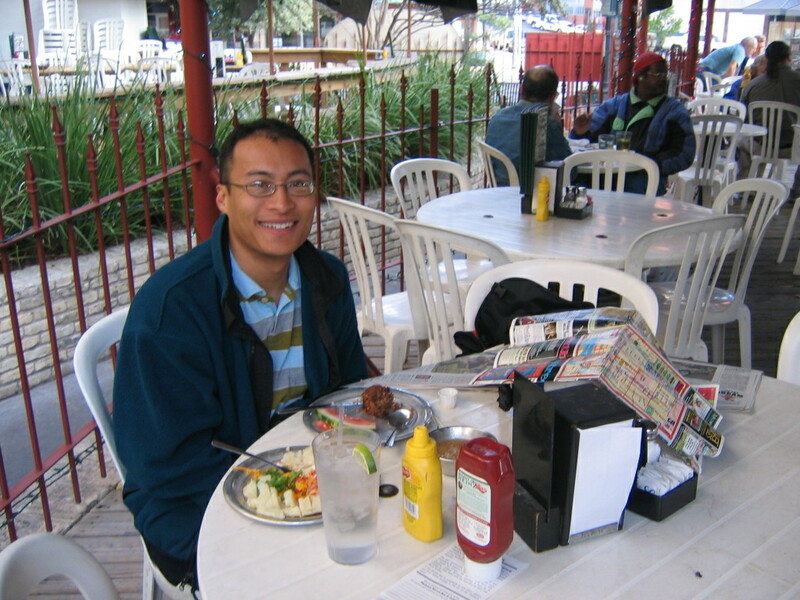 Austin is a perfect town for outdoor pursuits. The University of Texas is less than a mile from the downtown core, and the downtown core is situated on the banks of a river with trails galore. There’s even an outdoor swim park that is open year round. For more info, check this out: http://www.ci.austin.tx.us/parks/greenbelts.htm I spent the afternoon biking around the town and ducking into shops along Old Pecan Street (6th street). I even saw Woody Harrelson smoking some weed in some park. Ah, Texas. The biggest state west of the California border. Land of Big Trucks, oil, George Dubya Bush, carpenter ants, and famous for the shot on location “A Very Brady Christmas.” I drove in from Tucson to El Paso. Don’t confuse El Paso with Old El Paso. Old El Paso is a brand of Mexican food, featuring taco shells, seasoning, sauces, hot dogs, lemonade and car wax. You can find it at your local grocer, unless they are super fancy and only sell items labeled as “Private label,” “Gourmet,” or “Throw away in 7 days or else!” In that case, try Albertsons and you should find Old El Paso. But be sure to bring your Albertsons card, because if you don’t, you won’t be able to save 15 cents off the shelf price like their privileged ‘members’ do. Did you know that those loyalty card programs kill off 20% of our land mass air every minute? That’s right, the ozone is being depleted by our inability to comprehend the factual findings that leading scientists have compiled in the last 20 centuries, but our elected officials refuse to confirm this data because they have pork programs to consider. That is why, in the year 2029, you should vote for Pedro Peter Picadilly. He’s only 2 years old now, but he will make a fine president to lead our country. Or at least Texas. Dallas is home to that moment on November 22nd, 1963, when President JFK was assisinated. I visited the memorial and listened to the enterprising entrepreneurs trying to sell “souvenir” conspiracy programs and newspaper headlines. It made me want to watch the Oliver Stone flick, which he titled “JFK.” Which means John Frederick Kennedy. He wasn’t in the film, they used someone who looked like him. The real star was Kevin Costner. Maybe that’s why I never saw the movie. Cause everyone knows that Kevin Costner can only play 3 types of parts–a washed up baseball player; a post-aployptic anti-hero; and a disgraced sumo wrestler in in old frontier days. Which makes you think….has he ever been in the same movie at John Travolta? Hmmm. Dallas is on Central time, which means it is 12:32 as I write this, but actually only 10:32pm at home. I am tired. Been pretty active this whole past week. I’m happy I brought my bike. Tomorrow, Sunday, is the Dallas marathon. If I was crazy enough, I’d run it. But my body is so worn out. So instead, I biked part of the marathon route today, around White Rock Lake. Also caught a Dallas Mavericks – Boston Celtics basketball game–tickets were only $5, how could I pass it up? At anywho, you didn’t come to my travel blog to actually read about my travels, did you? I know you are really more fascinated with profound revelations about this world we live in and grand thoughts of wisdom that only travel can bring to the unbridled mind, yes? Well, you are in luck. I leave you with this quote, from my serious, harmonica-wielding friend Dave “Gherm” Barmon. He recommends to “Eat lots of poop.” I sleep now leaving you with that to digest. And maybe when I’m not so tired, my blog will actually make some sense. 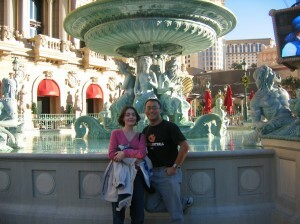 * My Vegas time is posted — http://devine.doitsports.com/vegas/. It’s official. 4 hours, 8 minutes and 27 seconds, or about a 9:30 pace per mile. 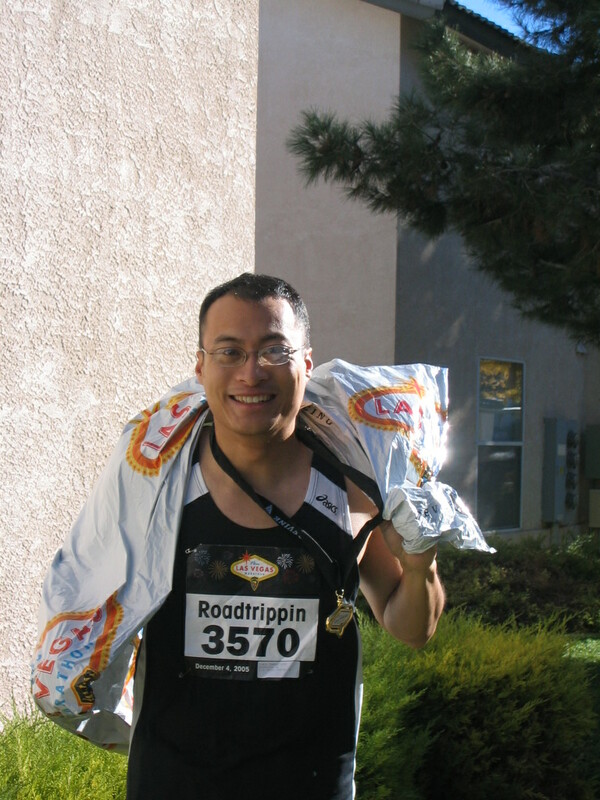 I think I could have done better since I felt like I had a lot of energy at the end of the race–it could be the 10 energy gel packets and 2 clif bars I ate while running helped. 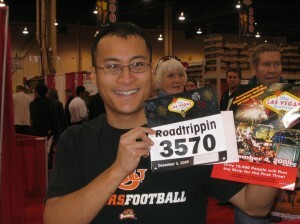 http://www.marathonfoto.com My bib number is 3570. * The car is still hanging in there–burning oil and a back tire that the gas guy exclaimed should be replaced–he even offered to put on my spare cause he said it looked that bad. But I took it to a tire place and the tire dude said I could probably drive another 500 miles on it…so I will! * Phoenix is one urban network of never ending strip malls and sprawl sprawl sprawl everywhere. Can there be anymore people driving and clogging the streets with smog? There are some nice places to visit in Phoenix, which I go into greater detail later–including an intense hike up Camelback Mountain that just about did me in because I have not fully recovered from the marathon. * I’m now in Tucson, using the public library computer and I have 2 minutes left!! 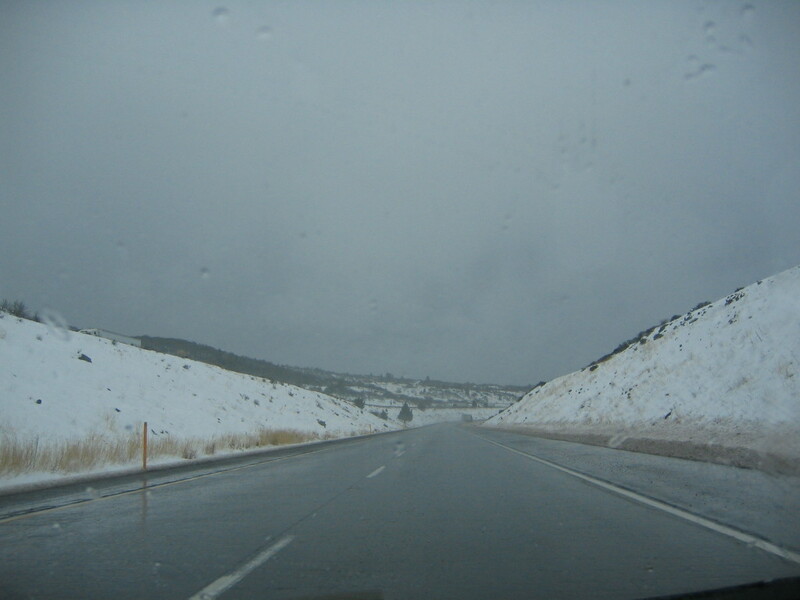 It’s on to El Paso, TX tomorrow… my Dallas contact, Phil, called me tonight and said that they are having freezing rain and snow, and added that Texas drivers drive CRAZY when there is snow and ice…hopefully I’ll avoid that come Friday. * Thanks for your comments, public and private, and Nicole & Hope’s infrequent horoscope updates and Family Circus comic strip interpretations. Until the next library I find, over and out!! 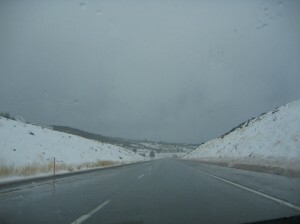 I brought the horrible Oregon weather with me from San Francisco to Las Vegas, with another close call. It also didn’t help that in the morning, I added oil to the car but forgot to replace the oil cap. So 200 miles later, a burning oil smell wafted into my car and traces of smoke emitted from my hood. I spent the next 30 minutes backtracking to Los Banos, CA, to an auto supply store and buying a replacement oil cap. My visit to Vegas was to compete in the new Las Vegas Marathon, which starts at the Mandalay Bay Hotel and Casino and proceeds 7 miles up along the World Famous Strip to the Fremont Street Experience in downtown. My goal was to complete it within 5 hours and with limited injuries. I’m staying with my pal Sarah, who I’ve known since high school and she is currently an art teacher for an elemtary school. We spent Saturday at the Health & Fitness Expo where I picked up my race packet, and we also drove the marathon course and visited a few sites along the Strip. Finally, Sunday morning, race day. I tried to turn in early at 8:30 the night before, but my sleep was in and out and my mind kept turning to the marathon. I haven’t trained for this! Two 12-mile runs in 3 months, and I was supposed to complete 26.2 miles? I woke up at 4am to beat the traffic rush and did all my pre-race prep in time for the 6am start time. A colorful display of fireworks greeted the crowd of 12,500 runners, in chilly 39 degree temperatures. 4 hours and 15 minutes later, I crossed the finish. 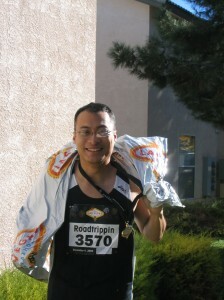 Unfortunately, my finish is not posted in the official results at http://www.lvmarathon.com. But I should have my official pictures shortly posted at http://www.marathonfoto.com (select the Las Vegas Marathon and enter my last name ‘Tanedo” and my race number 3570. I am proud to say that I finished strong and I ran a smart race. I never bonked out, never developed the crippling cramps of debilitating pain, and kept hydrated the whole race through. The last 2.2 miles were quite the mental challenge, but positive self-talk and passing other runners made for an encouraging and satisfying end to the slowest marathon I’ve ever run–but hey, with no training, I’m on a cloud 9! With my marathon finish, it’s now on to Phoenix, AZ…. Pretrip festivities with some my basketball teammates “Under the Rim”. Jeremy, Chris, Adam and Mike. Rene is in the Philippines on vacation, and Jonas decided to volunteer as a basketball couch instead of hanging out with his buddies. Yeah, you better win your basketball games Coach Jonas! Eugene, Aliscia and Jason. Congrats to Aliscia as she is a new homeowner with a wonderfully comfy home. 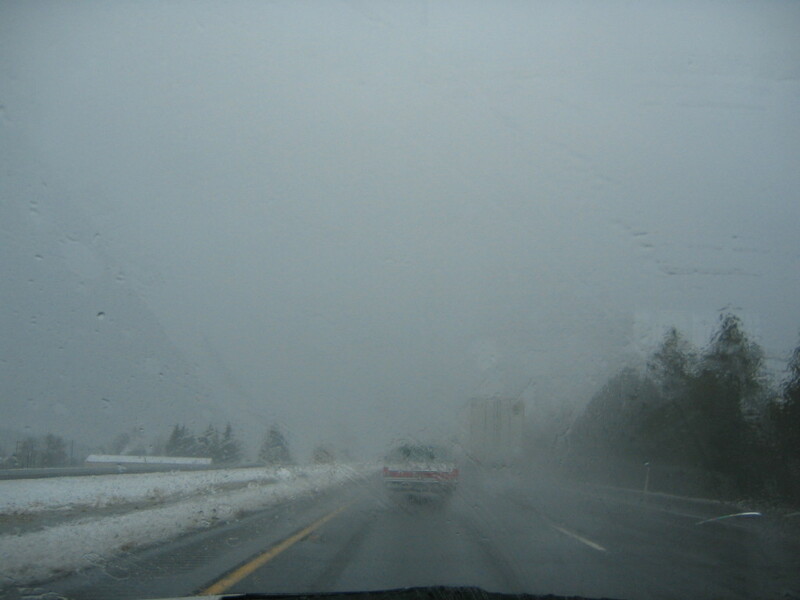 The drive from Eugene to San Francisco was horrendous, with traces of snow, torrents of rainfall and severe gusts of wind that toyed with my steering and challenged my tire’s tread. Had one very close call with a truck that cut me off and I was forced to the median. With near white-out conditions with the spray, he didn’t even know I was there…. San Francisco, Ezra, Tim & Dan. 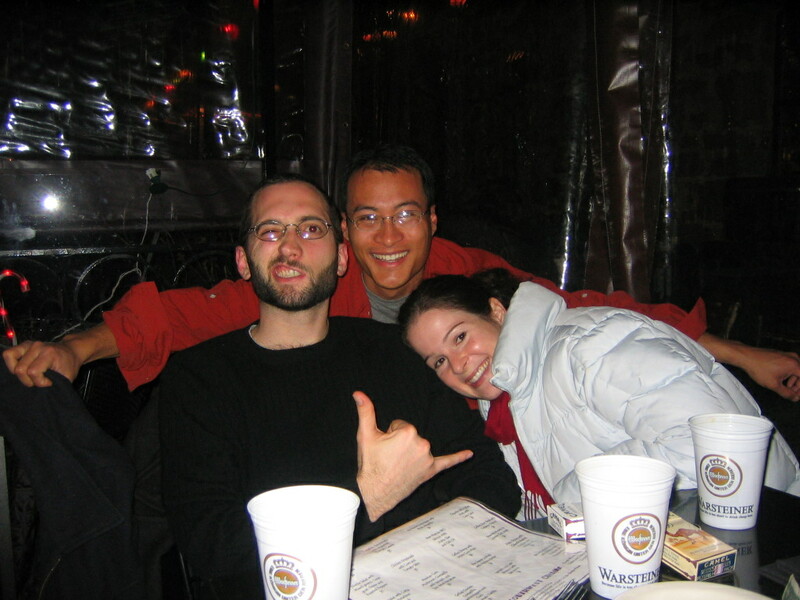 These were my hombres in AmeriCorps NCCC program in San Diego over 10 years ago. Ezra is an interpretive dance instructor for the blind, Tim is a wine sommelier for the local Scientology pit bull owners club, and Dan is an accomplished Hollywood screenwriter with such hits as “We Bad Boys Three” and “To Catch a Monkey, Eat Creamed Spinach” to his credit. His next feature, “Honduran Housewares,” is due out in a few weeks in time for Academy Award consideration. Welcome to my personal travelblog, which will detail my road trip journey across the States in my $500 beater car. Some of you have entered into the Honda Death Pool, in which you have pre-selected the state where my car will finally meet its destined demise and fall apart. If you guess the state correctly, you’ll share in a pot of $40 amongst the other contestants that have also picked the state. However, if the car successfully makes it all the way to New Jersey, I keep the money (which helps defray the cost of keeping me well fed and my car full of gas). I’ll be taking the Amtrak back home to Portland, via New York’s Penn Station through Chicago along the Empire Builder. I’ll be gone for almost 4 weeks. That is, IF, my car can make it all 5,350 miles. The total pot to split is $44.